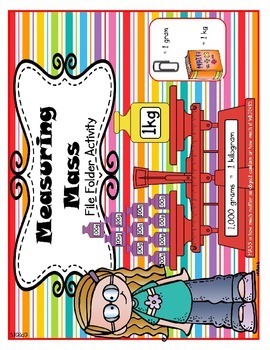 This set addresses the Common core standards for measuring mass. File folder activities are great to use during reading groups, math groups, or centers. 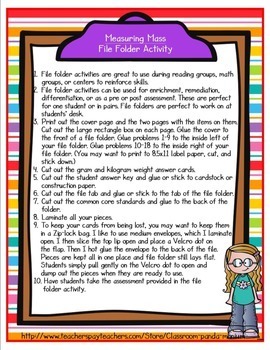 File folder activities take up very little space and are self-checking. Students can complete file folder activities on their own or with a partner. File folders fit perfectly on students' desks. They can be used for differentiation, remediation, enrichment, and pre or post assessments. This is also a great way to conserve paper. Just print and laminate. File Folder games last for years. Even the assessment can be laminated. Just use a vis-à-vis marker to fill in answers. Sheet then wipes clean. assessment worksheet including determining the best unit of measurement, estimating the unit of measurement, and solving word problems using gram and kilogram. Please view the preview file to get a better look at this product. 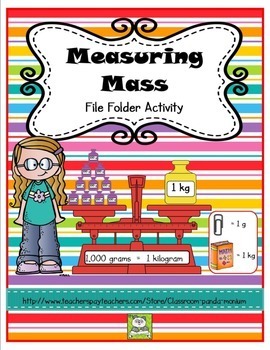 Need materials for other areas of measurement, check out my TPT store Classroom Panda-monium for Math File Folder Activities. 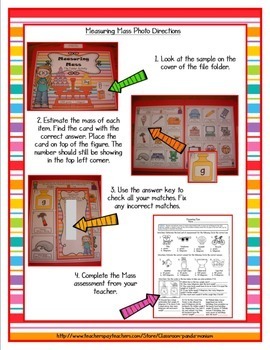 If you enjoy this file folder activity, please check out my other file folder products at my TPT store: Classroom Panda-monium. Thank you for expressing an interest in my file folder activities. By providing feedback, you can get TPT credits to lower your cost of future products. Just log-in and go to your "My Purchases" page. Click provide feedback button next to the item your purchased. Leave a positive feedback and receive credits for future purchases. Plus, it helps me know exactly what you like about the product. Interested in being the first to know about sales, freebies, and new products. Click the green star at the top of my page near the store logo and become a follower. You'll receive e-mail updates about this store.